So finally I’ve found great and easy way how to mount my PCB heatbed. Problems is that PCBs aren’t flat. If you’ve got your PCB and it’s not flat, its not a big deal. You always have to help it to be flat. Ideal stuff is glass sheet, since it’s cheap and pretty flat. What we also want is quick swap of the print surface. Before I tried mounting whole heatbed on magnets, unfortunately, it was more PITA then good solution. The glass in this solution wins again. Many people used the four holes in the corners to mount the bed on standoffs, which again wasn’t the most brilliant idea under the sun, since it wasn’t enough to keep the bed flat enough. 1) Place the heatbed on the wooden top plate on your Y axis and mark the corner holes and its outline on wood, remove heatbed and drill the holes with 3mm drill. 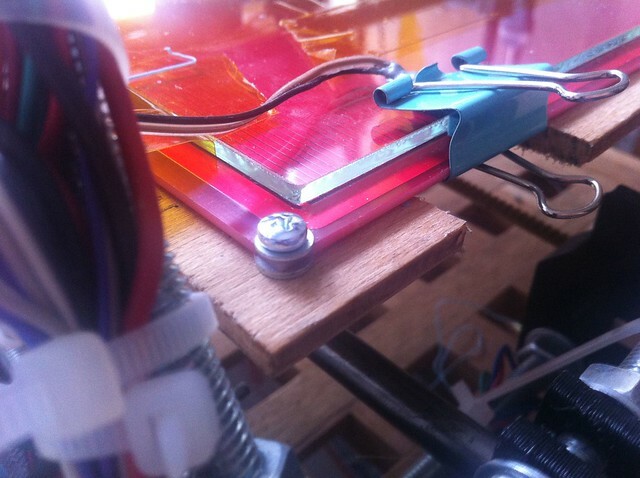 2) Place the bulldog clips on the marked contour of the heatbed and mark how deep it goes into wood. Then cut this pieces of wood away, it will allow you to freely hold the glass on bed with these bulldog clips. 3) Mount the pcb. Add three washers between the wood and PCB. It will allow the pcb to be more flexible = easier to make it flat with glass and also, air is better heat insulator then wood. 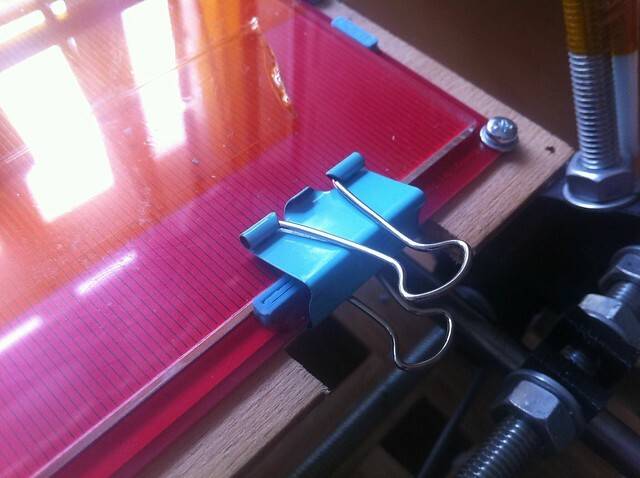 4) Use bulldog clips to hold the glass on the PCB. 5) Mount thermistor with some kapton tape on the glass. I place some wool and alu foil on that and then I tape it down again. There is also possibility to glue the thermistor on the bottom of PCB Heatbed with the epoxy, which will be more handy if the glass is changed frequently. 6) Put some kapton on the top of the glass or just clean it to print pla. I suggest to use my PCB heatbed with RAMPS 1.3 which has great support for heatbeds.Use some thick wires, the PCB will eat almost 11Amps. There are two 0805 surface mounts LEDs. 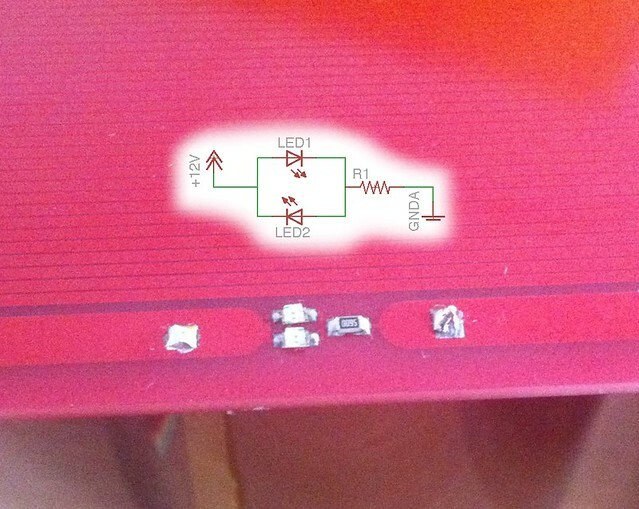 Idea is, to have each of the in different direction, so the PCB will shine if you connect it both ways. You also need one 0805 SMD resistor, 1kohm should be fine for every led to dimly signal you the activity of heatbed.